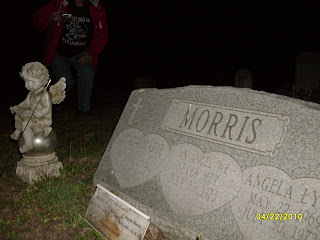 Amber, Brooke and I went to Spring Grove Cemtery a few nights ago. We explored the area in an attempt to prepare a tour for it. Only half of the cemetery is officially taken care of, through Liverpool Township. The other half, the front part, only gets attention when there are volunteers to do it. One of the main things they need is to have the rest of the road running through it chip and sealed. To that end my crew and I are preparing a tour of Spring Grove filled with the history, lore and legend of East Liverpool and this cemetery. A cost is yet to be determined at this time, as is a date. Our goal is to help get the money necessary to finish the chip and seal job. The video is the first of 4 videos being made from our midnight adventure. Hope you like it.